The day was expected to be the most relaxed day of the entire trip. The plan was to cover places near Kaza, namely Langza, Hikkim and Komic, which are all close to each other. I woke up late, got ready, had breakfast, all at a leisurely pace and left at 10am. The diversion to these places comes soon after crossing Kaza town, towards the right. I missed the turn initially and ended up on the road to Key-Kibber, but soon realised it and came back to the take the turn. As I was riding up, I was flagged down by a lady who had a small baby tied to her back in typical Tibetian style. She wanted a ride to Langza and was with a group of other women, who were all walking slowly and were also looking for a ride. They were all from Langza and had come to Kaza the previous day to attend the Spiti mela that had happened in Kaza the previous evening. There are public buses that go to these villages, but they are very few and far between. These three villages are all at an altitude in excess of 14000ft. and it is a steep climb from Kaza, which is at 12000ft. I can’t imagine how people of these villages manage to actually attempt to travel to their village by walk, even if it is only for part of the distance. At that altitude, I was finding it hard to walk even 10 metres uphill. My motorcycle struggled a bit with the steep climb and bad roads. It was first and second gear all the way through, as we made our way to Langza. The views progressively got better and many snow capped peaks made their appearance. The lady informed me that one of them was Shilo Peak. Soon, the village came into sight, as did another taller and attractive snow capped peak. This is the Chau Chau Kang Nilda (CCKN) peak that is 20000 ft. tall and looms over the Langza village. The village is spread over two areas, one lower and one higher up. The highlight of the village is a tall Buddha statue that is at the edge of a cliff, overlooking the mountains ahead. The village has a nice charm about it, with vast expanses in between the village and the tall mountains on all sides. The lady I gave a ride and many other people from the village worked on road repairs and maintenance in the area near the village. They are employed by the local administration and helps them earn additional money. Otherwise, the 155 people who live in the village entirely depend on farming, which can happen only for 6 months during the warm season. I had a nice chat over a cup of tea with one of the locals who ran a homestay (nearly all homes here also work as homestays). He told me that they mainly grew potatoes, peas, barley and occasionally some dal. He explained that the yield was low this year owing to lesser snowfall in the winter and water paucity. The winter months are spent mostly indoors taking care of the cattle and spending time with family. The villages are also often cut off from civilisation when the snowfall is heavy. It is very hard for us city dwellers to even imagine how these villagers spend their winters, limited to being indoors with no phone or internet, for several months at a stretch. The quaint Langza village, with well spread out houses. The CCKN mountain looms behind. Next stop was Komic. On the way, I spotted a fox that quickly crossed the road at a fair distance and ran away before I could pull out my camera and click. Komic is at an even higher altitude at close to 15000 ft. Billed as the highest inhabited village (a claim which I believe is false), Komic only has a monastery and a few houses. The monastery was of a reasonable size with 30+ rooms for monks to stay, though I wonder how many were actually occupied. I quickly made my way down to nearby Hikkim, which has a claim of its own, to have the world’s highest post office. The post office has become a popular tourist attraction and a lot of visitors including many biking groups were hanging around there, writing, posing and then posting letters to their near and dear ones. I posted a couple too. The letters are expected to reach distant cities after 10 days, but it is nice to see a working post office in such a remote and high altitude area. Each of the three villages has a population of less than 200, but have basic schooling facilities, which is again impressive. Roads connecting these high altitude villages. That is Hikkim, as seen from Komic. On the way down from Hikkim to Kaza, there is one point where one gets a splendid bird’s eye view of Kaza city and the valley from high up in the mountain. On reaching Kaza, first task was to find lunch as it was past 2:30pm. Thankfully, not only did I find lunch at a hotel/restaurant called Traveller’s Den, but it also had a working wifi connection (at 2G speed). Otherwise, internet rarely works in Kaza, even at BSNL 2G speeds. Post lunch, I made a quick stop at the monastery and this time it was open. There was some kind of a puja going on with chanting and the young monks lighting up lamps, closely monitored by a senior monk. Post that, I spent some time wandering around the market and buying a few essentials for the trip. I went back to the hotel, but not before filling up petrol for the ride to Chandrataal and until Manali, as there are no petrol pumps on the way. There was a cricket match on TV which kept me busy for most of the evening. I had dinner at the hotel itself and also spent time chatting with a Bengali group of 4 middle-aged men, who had also checked in at the same time I did the previous day and were traveling in the same routes as I was. They were traveling in an Innova and were also planning to visit Chandratal the next day. 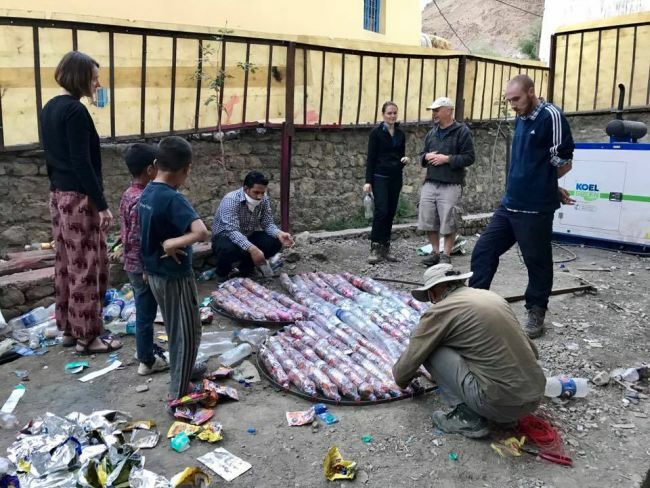 New Delhi: Spiti Valley in Himachal Pradesh – a traveller’s paradise has now one more attraction in its kitty and that’s the life-size art installation made from discarded plastic bottles and wrappers that travellers leave behind while visiting the valley. 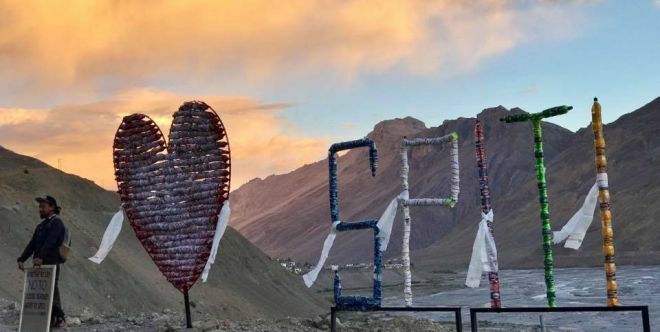 The installation has been put up by a 29-year-old travel blogger, Shivya Nath, and few other volunteers who spent 3 weeks in the valley last month in a bid to raise awareness about the harmful environmental consequences of using plastic water bottles in Spiti, that’s regarded as an eco-sensitive high altitude mountain desert. The idea behind the art installation that reads ‘I love Spiti’ was simple, just like all around the world, people take photographs with “I Love New York” and “I Love Amsterdam”, the volunteers decided to join the bandwagon and make “I Love Spiti” art installation, but, with a twist. The Green volunteers unveiled the masterpiece last month at 12,000+ feet in Kaza, the administrative capital in collaboration with Ecosphere, a social enterprise that emphasises on eco conservation, responsible mountain travel and adventure. Instead of drinking “Himalayan” water bottled in the plains – which leeches chemicals if buried, reused or burnt – we can refill our bottles with filtered real Himalayan water across hotels in Kaza and homestays in the upper villages, says Shivya Nath in a Facebook post. As per the research done by these volunteers, an estimated 3,00,000 plastic bottles are dumped in Spiti every season. In the absence of recycling centre in the valley, the only option there is to burn and bury the PET bottles, but, the harmful chemicals in plastic bottles can affect the groundwater and soil. So, to drive home this point, the Swachh volunteers built this thought-provoking masterpiece. Apart from the art installation, the volunteers are hoping to have a sizeable number of hotels, restaurants and cafes across Kaza equipped with water filters and filter-fitted bottles, to cut down on bottled water use. They also hope that by next season Spiti will have cute sign boards made with discarded plastic bottles indicating water refill stations, and posters that reveal shocking facts about plastic bottled water. Lucky, the hotel manager, had arranged for my motorcycle to get a much required clean-up the previous evening. I went through the daily routine of loading the luggage and left Kaza early. On leaving Kaza, there are two routes - one towards Key, Kibber and beyond; the other one being the main highway that continues towards Rangrik. The two routes eventually merge and continue towards Losar and Kunzum Pass. Key and Kibber are not too far from Kaza. However, the plan was to reach Chandrataal by evening and I had heard stories about the bad roads leading to the place, so I didn’t want to leave things too late. Key Monastery is considered to be the most important monastery in the Spiti region. The monastery is a fairly large complex, built at a height in a semi-circular fashion and looks pretty. When I reached the monastery, the elaborate morning prayer ritual was going on. I joined in and observed for a while. As the prayer progressed, more and more monks came running in and joined in the prayer. More visitors also joined, each with a small bowl. At a particular stage, a monk served some liquid to each person in the bowl and everyone took a break to drink. It tasted a bit salty, seemed to be made of milk (I later learnt it was yak milk tea). As I stepped out of the prayer hall, a monk who was waiting outside asked if I would like to visit the temples on the higher floor. He showed me around a few rooms that had a lot of paintings and murals and explained that the monastery had more than 100 monks, with several others traveling to villages in the region. The monastery belonged to the Gelukpa sect of buddism and he explained that there were minor differences between the different sects, mainly in the way they prayed. Nice of the monk to take the initiative and show me around the monastery. The views from the top floor of the monastery of the surrounding mountains and valley were stunning, as I had come to expect by now. As I was leaving the monastery, I observed a bunch of kids who studied in the monastery and were at the monastery canteen shop after the morning prayers, trying to buy some toys and snacks. Some of them were excitedly playing with the toys they had just bought. At the parking lot, as I was pulling out my motorcycle, the Mumbai biking gang were making their way to the monastery. Kibber is just a few kms away and there was nothing special about the village that I could observe. It is supposed to be a very cold place in the winter months. I had a quick breakfast at one of the homestays and learnt from the restaurant owner that there is an NGO group from Bangalore that does a lot of conservation work in the Himalayas, that is active in Kibber and surroundings. Beyond Kibber, I came across a long suspension bridge called Chicham Bridge. There was a deep gorge below the bridge and a village in the distance. I learnt the bridge was built and inaugurated somewhat recently. The scenery from this point is spectacular, all the way until Losar and I took liberal photo stops. In particular, there is one view point where one gets a wide view of the mountains and valley from a vantage point, one of the highlights of the trip for me. While I was there, a large group of visitors stopped by in two vans; they were headed in the direction of Kaza. They were all from Bangalore and other places in Karnataka. Many of them were surprised to see a fellow-Bangalorean traveling solo on a motorcycle and were happy to converse in our local language, asking about my trip and what lay ahead for them. A few photos and goodbyes later, I was on my way again. A few kms before Losar, the road turns bad and it stays this way until Rohtang, only getting worse at different places. At Losar, I first attempted to stop at Nomad’s Cottage, a popular hotel, for lunch. To my surprise, the hotel manager came to me talking in Kannada, on noticing my vehicle’s Karnataka registration plate. He was from Bangalore and was temporarily placed by his company, Nomadic Destinations, at the location for a few weeks. They were not ready yet to serve lunch, so he advised me to try one of the small dhabas in the town. At the dhaba, I came across the same Mumbai biking gang and their friends from Bangalore. The lunch menu was the usual Rajma chawal and Maggi and as usual, I opted for the former. The Mumbai gang also had a kannadiga among them and I was chatting with many of them about their ride plan, my plan and other topics. I learnt that they had a mechanic traveling with them all the way from Chandigarh. On hearing this, I decided to ride a little ahead of this group, so that I could be covered in case of any vehicle problems. The person from Bangalore owned a furniture unit and a couple of showrooms and did interiors for residences. I took his phone number so that I could get in touch with him later in Bangalore, for my under-construction new house. As I approached Kunzum La, the weather appeared to be worsening in the mountains on one side. However, the route always took me away from the bad weather. Kunzum La is a pretty pass with a large, flat area with a temple and chortens. An HP govt. transport bus had also stopped there for a while for travellers to stop and take photos. There are three snow-capped, photogenic peaks that are directly visible from the pass. The road worsened significantly after the pass, with bigger stones protruding everywhere along with loose sand. Soon, there was the diversion to Chandrataal, the latter being 13.5kms away from that point. On the way, there were two longish water crossings and my feet got wet in one of them. The camps soon came into sight and I figured out that some of them had already closed for the season. After checking with a couple of them, I finally settled down at Cold Desert Camps, for a reasonable price. As the weather was a bit unpredictable, I dropped off my luggage at the camp and immediately rushed to the lake. It is a ride of 3 kms or so up a steep, narrow and rough road to reach the parking area for the lake. From there, it is a walk of close to a km to reach the lake. There were plenty of tourists at the lake, with one particularly large group of trekkers doing a lot of posing. The group had just completed the Hampta Pass trek and were visiting Chandrataal to celebrate conclusion of the trek. Some members of the group were from Karnataka and there was a fair bit of Kannada spoken around. The Chandrataal lake is smallish but pretty, surrounded by mountains on all sides. Not as high in altitude as the ones I visited in Ladakh two years ago, but still worth the visit. On the way back, I offered a ride to a British tourist, who was traveling alone and had managed to walk all the way up to the lake from the camp. The Mumbai gang had also made their way to Chandrataal and were staying at the nearby Jamayca camp. One of the SUVs they were traveling in had an issue and they were all trying to address it. The Bengali group whom I had met at Kaza were also in another nearby camp. It got terribly cold after sunset and I quickly got under the thick rajai and blanket to keep warm. After dinner, I joined the camp owner inside the tent where the tandoor was burning. I spent nearly an hour there in the warmth, exchanging stories with the camp owner and a few other guests who had also joined in for the warmth. It was a good decision to reach Chandratal for the night, rather than spend the night at Losar or some other place. This way, I could start early the next day towards Manali.